A hallmark of the RCRL research program is its unique combination of recognizing subsurface characterization challenges that can be improved by the use of well-defined outcrop analogs and a breadth of subsurface characterization experience that is brought to bear on problems important to sponsors of the program. In the 30 years of RCRL research on carbonate systems, technical methods have been developed that populate the sequence stratigraphic framework with reservoir-flow properties so as to improve hydrocarbon recovery. Yet many challenges still exist within carbonate reservoirs, especially in the area of integration of nonmatrix pore systems (e.g., fractures and karst), pore-network-related diagenesis (e.g., micropores/tight carbonate reservoirs), and the realistic three-dimensional variability of lithofacies distribution. 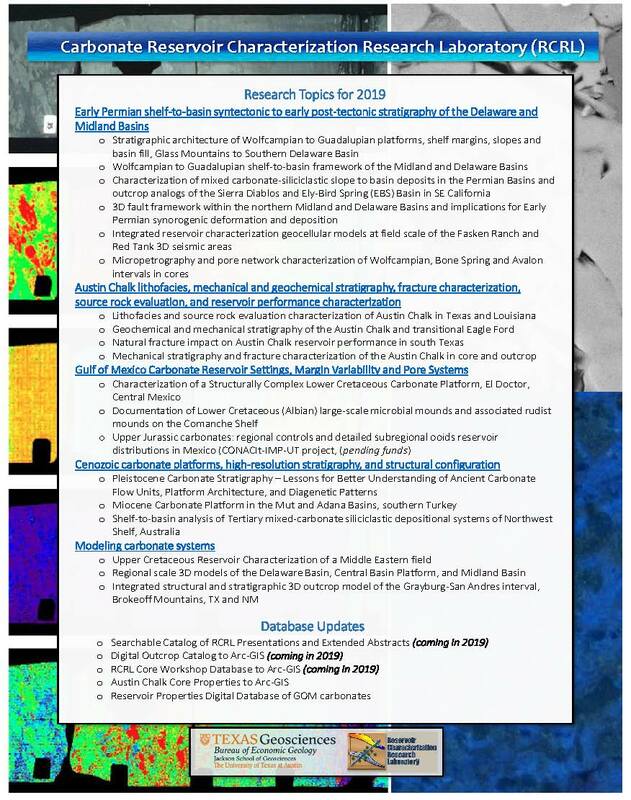 The 2019 research directions are described in more detail in our 2019 Executive Summary and Prospectus.